4.8.13.10 The purpose of this schedule is to provide information about the liabilities of the local government. This schedule is required to be included as supplementary information with any audited financial statements. 4.8.13.30 Local governments are required to update the incorrect financial data submitted on this schedule. The requirement applies to all errors found prior or during an audit. 4.8.13.40 The schedule should be prepared on the same basis of accounting, for the same period and reporting entity, and using the same underlying accounting records as the Schedule 01 and financial statements. The schedule should include current and noncurrent liabilities. Payments due to vendors or employees that are expected to be paid normally as part of the disbursement cycle, such as any accounts payable and payroll accruals that may not have been resolved during the open period. Operating leases or other contracts or commitments for future purchase of goods or services that have not yet been realized. Interfund payables and loans (for details regarding interfund loans see Loans). 4.8.13.60 Governments should not report liabilities of fiduciary funds for which the government is not itself obligated. For example, a county would not report liabilities of special purpose districts. 4.8.13.71 Proper classification of grant and loan transactions require the analysis of the underlying documentation. The criteria for determining if a funding source is a grant (revenue) or loan (other financing source) is the existence of a note payable or loan contract. For annual report purposes, Schedule 9 should report all loans. Schedule 16 should report all federal grants, including grant loans – that is, loans from federal granting agencies that have continuing compliance requirements as described in the Schedule 16 instructions. For this reason, federal grant loans will be reported on both the Schedule 9 and 16. 4.8.13.81 A loan with a forgiveness clause is a contract that contains provisions for the loan to be forgiven if certain criteria is met. For example, a lender may provide a loan to a government to construct a building and allow for forgiveness of the loan if the building is used for low income housing for 40 years. Most loans with forgiveness clauses do not require any payments for a specified time, but some can require regular payments or interest-only payments. Transactions should be reported as loans if a note payable or loan contract is outstanding, even if the lender does not require payments and the loan contains a forgiveness clause that the government expects to eventually meet. Loans with forgiveness clauses should be accounted for as debt proceeds when received. Terms of these transactions need to be presented in the notes to the financial statements. The disclosures should include the assets acquired with the resources, conditions to be met for the transaction to become a grant, what circumstances require repayment, and the amount to be repaid (e.g., interest, appreciated value, etc.). When a government has satisfied the criteria for the loan to be forgiven, grant revenue can be recognized along with a loan repayment. A recoverable grant is a contract where the grantor can require repayment if the government fails to fulfill the requirements. Some recoverable grant contracts also require return of the appreciation in value of the asset as well as the original funding amount. Recoverable grants are non-exchange transactions and should be reported as revenue when the eligibility requirements are met. If the government has received a recoverable grant, the conditions for recoverability must be disclosed in the notes to the financial statements. The items requiring disclosure include: the asset the grantor has an interest in, the amount the grantor can require to be returned, and the conditions that trigger return of the grantor interest. 4.8.13.90 All debt should be listed on Schedule 09, regardless if it is for operating, capital or refunding purposes. Debt should be reported at face value (that is, only the principal amounts of debt should be reported and not any anticipated interest). Provide total amounts of beginning balance, additions, reductions and ending balance. For reporting the LOCAL program related liabilities see 3.4.11.50. Refunding transactions (including advance refunding through legal or in-substance defeasance) should be reported on the schedule as reduction of the refunded debt and addition of the new debt. 4.8.13.100 All the following types of liabilities should be included in the schedule using the most appropriate identifying number. A general obligation debt or liability is one that is secured by a pledge of the full faith and credit of the government and its taxing power. This means that the government would be obligated to repay the debt using all available means, including raising taxes to the extent allowable by law. General obligation debt and liabilities are subject to constitutional and, for certain government types, statutory debt limits. Miscellaneous debt – report any formal debt instruments that have a specific general obligation pledge that are not properly categorized to other Debt IDs, such as mortgages, loans from non-government organizations or loans from individuals. Miscellaneous liabilities – report any other liability with a specific general obligation pledge within the scope of the schedule but not properly categorized under any other Debt ID. Include in this category all obligations that do not have a specific general obligation pledge debt regardless of the fund type that is reporting this debt or liability. This category should include revenue debt, other secured debt (e.g., mortgages, etc.) and unsecured debt (e.g., compensated absences, etc.). Exclude the assessment debt. Revenue debt is secured by a pledge of revenue from a particular activity, such as a water utility. Unsecured debt and liabilities are those that do not specifically pledge an asset as collateral or revenue source for repayment. In cases where a debt or liability is secured by either a revenue or asset as well as a specific pledge of the government’s full faith and credit, the debt should be classified as general obligation using the codes listed above. Compensated absences. List the amount of beginning balance, additions, reductions and the outstanding balance of compensating absences at the year end. That is, the amount that would be due to employees to buy-out vested leave balances if employment had been discontinued at fiscal year-end. It is acceptable to show only the net change as an addition or a reduction. The calculation should include the associated employer costs such as social security taxes, FICA, and retirement contributions, when applicable. Governments without any buy-out provisions for sick or vacation leave would not report any liabilities. Claims and judgments – only report amounts of any unpaid settlement agreements or judgments against the government as of year-end. All unpaid judgments should be reported regardless of whether the government intends or is in process of appealing or settling the judgment. Liabilities for landfills closure and postclosure – report balances and changes in the same amount as reported to the Department of Ecology on your financial assurance analysis annual update (as required by WAC 173-351-600, WAC 173-350 and WAC 173-304). Revenue warrants issued by cities pursuant to RCW 35.41.050, by ports pursuant to RCW 53.40.135, by municipal airports pursuant to RCW 14.08.118, or by water districts pursuant to RCW 57.20.027. Miscellaneous debt – report any formal debt instruments that are not properly categorized to other Debt IDs, such as mortgages, loans from non-government organizations or loans from individuals. Miscellaneous liabilities – report any other liability within the scope of the schedule but not properly categorized under any other Debt ID. Pension liabilities – report the net pension liability amount. For all state-sponsored pension plans (such as PERS, PSERS and LEOFF), this amount is available from the Department of Retirement Services; a short video providing a guidance on finding these amounts is available here. 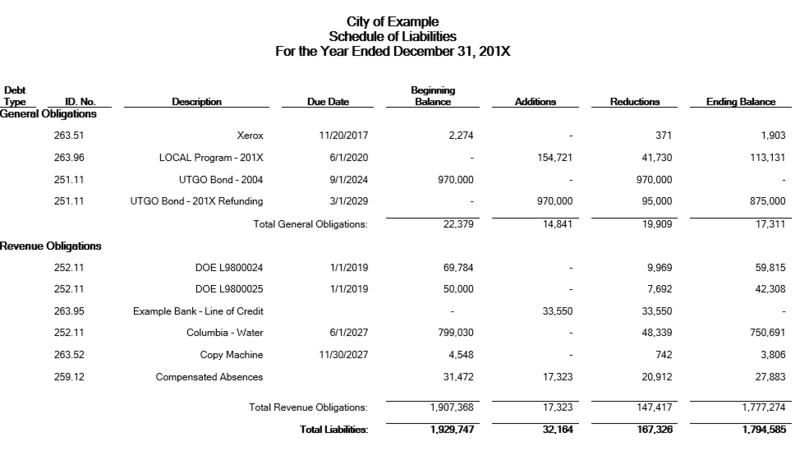 An assessment debt or liability is issued by the government but secured only by revenue from taxes on a certain area, such as a Local Improvement District. Only assessment debt with commitments should be reported on the Schedule 09. If the government is obligated in some manner to assume payments on special assessment debt in the event of default by the property owners, it is assumed the government has a commitment. In cases where the debt or liability is also secured by the government’s full faith and credit, the debt should be classified as general obligation using the codes listed above. Identifying Number: Include appropriate number (see the listing on the previous page). Description: Include the identifying name, number and/or description of the debt or liability. For bonds, notes, and other loans, list each debt issue separately providing date of original issuance. Maturity/Payment Due Date: Use this column if there is a fixed date for final payment of the liability. If there is no fixed date for final payment, this column should be left blank. Beginning Balance: This column should include the amount that was owed at the beginning of this period. The amount shown should equal the last year ending balance. If there is a discrepancy, please attach an explanation. Amounts should be rounded to the nearest dollar. Additions: In this column report the entire amount of any new debt, any additional debt issued (or borrowed) and any increase in liabilities during the current period. For example, if a G.O. bond was authorized in the previous year at $5,000,000, with $4,000,000 issued that year and an additional $500,000 issued in the report year, this column should show $500,000. Reductions: In this column, report the amount of debt that was paid or reduction of liabilities during reported period. Do NOT include interest paid on the redeemed debt. The total amount of redeemed debt should equal payments reported on Schedule 01 (object code 70). Include here decreases due to triggering a forgiveness clause or otherwise having debt forgiven. BARS Code for Redemption: Applies to debt only. The code is optional except for cities and counties which are required to use 59195 for all debt related to streets and roads. This column is not presented in the final version of the schedule. Ending Balance: In this column, report the amount of debt and other liabilities that were owed at the end of reported period. Ending balance is calculated by adding Beginning Balance and Additions and subtracting Reductions. 4.8.13.120 The template for Online Filing is available on SAO’s website page at BARS Reporting Templates. When using the Online Filing option, the system will create the schedule based on data provided by the local government on the template. Governments can manually enter the information or upload an Excel file that adheres to the prescribed record layout. The prescribed record layout is shown in the template provided on the website. The following is an example of a completed schedule.